Laelia (Schomburgkia)species in situ in Peru. Photo © E. Hunt. The orchid family is composed of approximately 25,000 different species and is sometimes thought of as the largest plant family in the world. 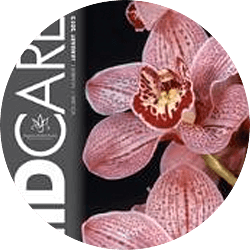 In addition, from the viewpoint of distribution, the orchid family is represented from the near sub-artic regions to the tropics with edaphic and climatic ranges that almost reach the apex of extremes. 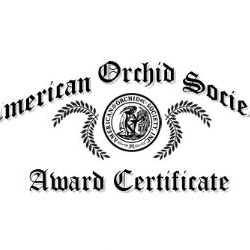 Due to the tremendous physiographic diversity of the orchid family, one genus has been chosen for this study. 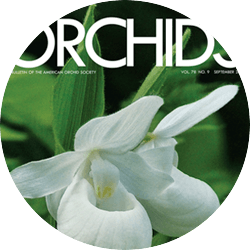 In this paper, the author will attempt to describe the habitat of the Cattleya orchid (an endemic tropical genus) in relation to the community where it is found. By definition, "a habitat of an organism is the place where it lives or the place where one would go to find it." In regards to the cattleyas, the region would be the tropical rainforests of South America. Rainforests occur in the Amazon and Orinoco basins of South America and on the Central American isthmus. Rainfall exceeds 80-90 inches a year and is distributed over the year, usually with one or more relatively "dry" seasons. This variation in temperature between winter and summer is less than that between night and day. 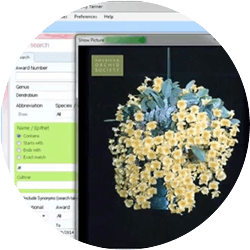 Therefore, seasonal periodicities in activities of plants are largely related to variation in rainfall. The profusion of epiphytes (orchids, ferns and bromeliads) perhaps reaches its culmination in the tropical rainforests. Ecological competition is great in "jungle" growth. The competitive interaction involves common space, nutrients, light, moisture, and other types of mutual interactions. 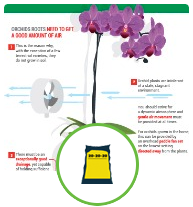 Light- and air-loving orchids would have been pushed out of existence if they had not "moved" up and away from the stifling mass of undergrowth. The whole top of a rainforest is an aerial garden. Cattleyas and other species of plants have adapted to clinging to tree trunks, in crotches, and along the branches, literally creating a "second story" of vegetation in terms of stratification. Plants that live thus up on other plants are called "epiphytes", "epi" meaning above or upon and "phyte" meaning plant. There epiphytes are not parasitic (the term "commensalisms" is more applicable), but merely grow where they can find support and a collection of nutrient material. They obtain mineral requirements from decaying vegetable matter and manufacture their own food via photosynthesis. The cattleyas have cleverly adapted their structure to their needs as air-dwellers. Clinging as they do to space deposits of decaying debris, they do not have access to the continuous water supply that terrestrial dwellers have on the ground. 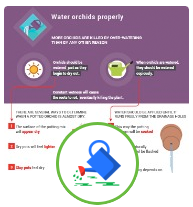 Therefore, the plant has become dependent on catching rain and dew, and on living only in a region of high humidity. Epiphytic colony - Ecuadorian Rainforest.Photo © E. Hunt. 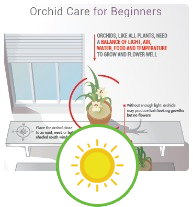 Most cattleyas have developed reservoirs in the form of thickened stems (pseudobulbs) and fleshy leaves, which store both food and water, and keep the plants from drying out between rains. In the aerial vegetation layer of the jungle, the plants that can resist drying most efficiently inhabit the topmost branches. Those that do not have as large a water reservoir live on branches lower down where they are less exposed. It is in the airiest and highest regions of the canopy that the cattleyas thrive. In terms of geographic location, cattleyas come from the tropical regions of Central and South America, largely from Venezuela, Brazil, and Colombia. Panama is the northern limit of these South American species. 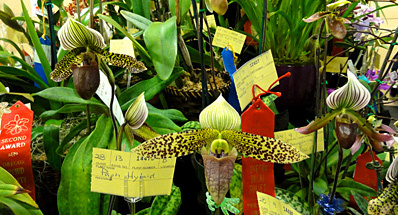 In America, on of the most active collectors of South American orchids was the late John E. Lager of Summit, New Jersey, who stated that the Republic of Colombia is one of the riches in Cattleyas, many different species being spread over its entire territory. The greatest numbers are to be found on the eastern foothills of the Central Cordillera, which is a continuation of the Peruvian and Ecuadorian Andes. The river valleys of Cauca, Magdalena and Los Llanes de St. Juan, or the Cazanare are the more specific regions of the Central Cordillera. In this area, cattleyas are found from 2,000 to nearly 5,000 feet above sea level, almost invariably growing in the branches or on the trunks of living trees. Mr. Lager stated that the best specimen plants were found growing in almost full sunlight (a further indication of escape from the "jungle" floor). In regions where the plants are found growing along narrow streams, the forest shade is so dense that the plants received little sunlight, and in such locations did not flower, but developed long, thin pseudobulbs. In their native habitat, the more exposed the plants are to sunlight, the more profuse they are in flowering. At lower elevations, cattleyas invariably grown along the courses of streams. On higher elevations they are found growing in deep hollows or gullies. The explanation is quite simple, because the atmospheric moisture (humidity) in river valleys and elevated gullies is high. Most Colombian cattleyas have no well-defined resting period (evergreen), but seasonal periods of two rainy and two dry seasons during the year do occur. Variations in elevation and climate, however, seem to influence their period of flowering. Thus, though cattleyas (and all epiphytes in general) are a very characteristic element in the structure of the rainforest, their role in its economy is small. Their chief interest lies in the clearness with which their distribution is correlated with the ecological factors of microclimate, illumination, etc., and in their extraordinary structural specializations, which more perhaps than those of any other group of plants, truly deserve to be called adaptations. If stratification at different levels in a rain forest is controlled by light, air movement, water supply and microclimatic factors, then epiphytic succession should be evident and cattleyas may well be termed the climax of the epiphytic layer. Cattleya mossiae growing on the limb of a tall Bucare tree near Guanare, Venezuela. Photo © G. Allikas.